First there was Doraemon, imported from Japan. Now there is Weather Boy! (觀測站少年), made in Taiwan. Both are aimed at children. Weather Boy! is a climate-fiction animation feature by award-winning Taiwanese directorChiu Li-wei (邱立偉) which is being screened nationwide on the Public Television Service (PTS). 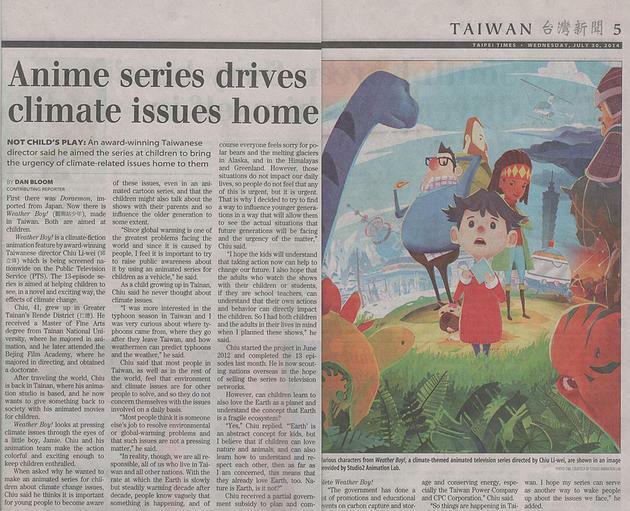 The 13-episode series is aimed at helping children to see, in a novel and exciting way, the effects of climate change. Chiu, 41, grew up in Greater Tainan’s Rende District (仁德). He received a Master of Fine Arts degree from Tainan National University, where he majored in animation, and he later attended the Bejing Film Academy, where he majored in directing, and obtained a doctorate. After traveling the world, Chiu is back in Tainan, where his animation studio is based, and he now wants to give something back to society with his animated movies for children. Weather Boy! looks at pressing climate issues through the eyes of a little boy, Jamie. Chiu and his animation team make the action colorful and exciting enough to keep children enthralled. When asked why he wanted to make an animated series for children about climate change issues, Chiu said he thinks it is important for young people to become aware of these issues, even in an animated cartoon series, and that the children might also talk about the shows with their parents and so influence the older generation to some extent. “Since global warming is one of the greatest problems facing the world and since it is caused by people, I feel it is important to try to raise public awareness about it by using an animated series for children as a vehicle,” he said. As a child growing up in Tainan, Chiu said he never thought about climate issues. “I was more interested in the typhoon season in Taiwan and I was very curious about where typhoons came from, where they go after they leave Taiwan, and how weathermen can predict typhoons and the weather,” he said. Chiu said that most people in Taiwan, as well as in the rest of the world, feel that environment and climate issues are for other people to solve, and so they do not concern themselves with the issues involved on a daily basis. “Most people think it is someone else’s job to resolve environmental or global-warming problems and that such issues are not a pressing matter,” he said. “In reality, though, we are all responsible, all of us who live in Taiwan and all other nations. With the rate at which the Earth is slowly but steadily warming decade after decade, people know vaguely that something is happening, and of course everyone feels sorry for polar bears and the melting glaciers in Alaska, and in the Himalayas and Greenland. However, those situations do not impact our daily lives, so people do not feel that any of this is urgent, but it is urgent. That is why I decided to try to find a way to influence younger generations in a way that will allow them to see the actual situations that future generations will be facing and the urgency of the matter,” Chiu said. “I hope the kids will understand that taking action now can help to change our future. I also hope that the adults who watch the shows with their children or students, if they are school teachers, can understand that their own actions and behavior can directly impact the children. So I had both children and the adults in their lives in mind when I planned these shows,” he said. Chiu started the project in June 2012 and completed the 13 episodes last month. He is now scouting nations overseas in the hope of selling the series to television networks. However, can children learn to also love the Earth as a planet and understand the concept that Earth is a fragile ecosystem? Chiu received a partial government subsidy to plan and complete Weather Boy! “The government has done a lot of promotions and educational events on carbon capture and storage and conserving energy, especially the Taiwan Power Company and CPC Corporation,” Chiu said. “So things are happening in Taiwan. I hope my series can serve as another way to wake people up about the issues we face,” he added. © 2015 All Rights Reserved. Design by studio2.